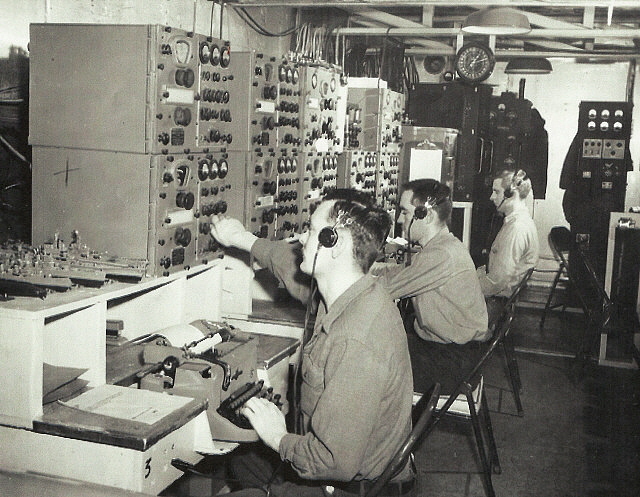 photo above: U.S. Navy Shipboard Radio Room showing WWII RAK/RAL & RAO/RBL receivers along with the LM Freq Meter far upper right and the Scott SLR receiver located just below the order binders. 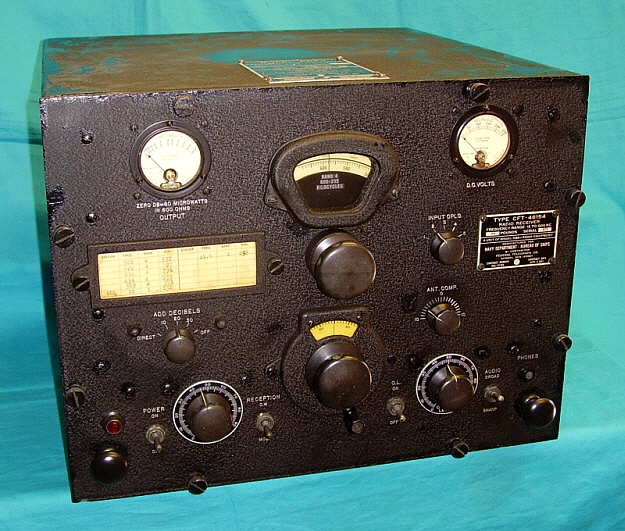 RCA built the earliest versions of this radio direction finding receiver for the Navy for use in search and navigation. The DZ-2 dates from 1939 though there were additional contracts built by other companies during WWII. 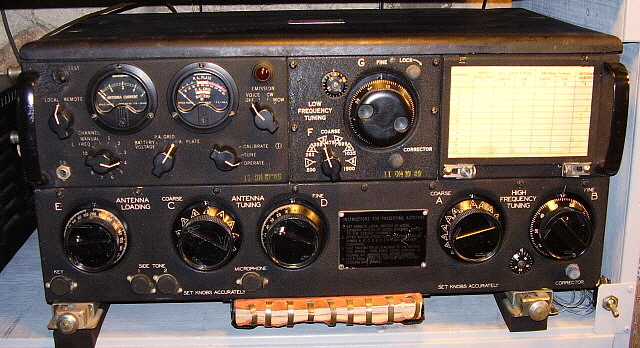 Using 8 tubes in a superhet circuit and tuning from 15 to 70 kc and from 100 to 1750 kc, the DZ-2 used a rotatable dual loop antenna and a fixed vertical antenna (usually a "T" wire from the cockpit to the tail) to determine "true" direction (called Uni-lateral Reception/Sense.) Non-directional and Bi-directional options were also provided. The dual loop antenna was mounted in an aerodynamic housing on the exterior of the fuselage and the remote drive control provided a readout of the loop's relative position for the radio operator. The DZ-2 also featured a BFO and Audio Filters. The receiver uses a cushioned shock mount. Power provided by the aircraft battery buss and an external dynamotor for B+ requirments. 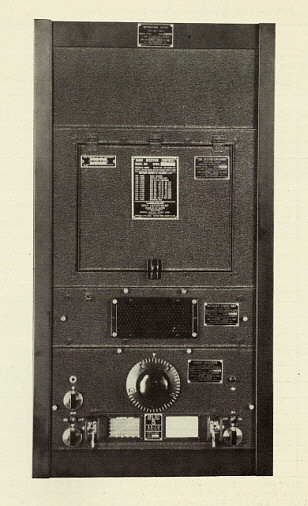 Designed for the Navy by RCA in 1935, the RAK and RAL receivers were intended to replace the Sylvania-built RAG and RAH receivers designed in 1933. The RAK/RAL cover the same frequencies as the RAG/RAH and are about the same approximate size. Although the Navy had RCA design superhets for both LW and HF (the RAA and RAB from 1931) there seemed to be a reluctance to use the superhet on LW and the Navy receivers that followed were all TRF with Regenerative Detectors until the late-thirties. The RAK and RAL were used in various shipboard applications (also submarine) up through WWII. The two receivers were ruggedly built and reliable in their design simplicity. The RAK is a six tube TRF receiver with regenerative detector that covers 15 kc up to 600 kc in six tuning ranges. The RAL is also a six tube TRF receiver with regenerative detector but covers 300 kc up to 23 mc in nine tuning ranges. Tube line up is the same for both sets with four 6D6 tubes and two type 41 tubes (earlier versions of the RAK and RAL used earlier version tubes.) Both receivers use a dual dial readout (0/00 to 10/00) that must be correlated to a graph in the manual for tuned frequency. Each receiver has its own separate power supply, the CRV[CND]-20131, which provides power through a ten foot long cable that connects to a terminal strip inside the receiver. The power supply uses a 5Z3 rectifier, an 874 regulator tube and an optional 876 ballast tube that was supposed to be used when the AC line voltage was subject to fluctuations (supposedly that would cause instability in the RAL receiver at higher frequencies.) The AC supplied on ships wasn't always stable and fluctuations could occur with just about any switched load on the line. Meters on each receiver monitor the tube heater voltage (right) and the audio output (left.) The RAK receivers were intended for CW or MCW reception only as a low pass filter is permanently connected in the circuit to limit the upper audio response to about 1200 hz. The RAL has the option of allowing the low pass filter to be switched out of the circuit (switch in "BROAD" position) and can therefore can be used to receive voice transmissions along with CW and MCW signals. An elaborate audio AVC system is employed in both receivers that was a common RCA circuit that performed as an "output limiter" to cope with atmospheric noise, static, lightning bursts and to limit overloading from strong signals. An audio bandpass filter system is also employed in each receiver that allows the operator to select various audio frequency ranges via a front panel switch. The audio output Z is 600 ohms and is intended to drive earphones (but it will drive a 600 ohm Z speaker quite well.) The RAL and the RAK receivers were designed to work together through a separate control box (CRV[CND]-23073) that allowed the operator to monitor two frequencies simultaneously (each receiver tuned to different frequencies with the audio from each combined) and also to control power to each receiver. Considered by many military radio collectors to be the ultimate in WWII receiver design, the RBA, RBB and RBC receivers were "cost-no-object" in design and construction. The resulting performance was so good that these incredible receivers were still in-use by the USN two decades after WWII ended. Today, many vintage military radio amateurs use either the RBB or RBC as their station receiver while long wave enthusiasts consider the RBA the best vintage low-frequency receiver available. In the late thirties, it was becoming apparent that a replacement receiver was necessary for the aging RAA series of superhet longwave receivers that were initially designed in 1931. Also, the Navy was still using the RAG (1933) and the RAK (1935) LF receivers in some installations. RCA's and the Navy's new design was going to blend the advantages of the TRF designs of the RAK with the TRF and non-regenerative detector with tracking BFO of the RAG. For shipboard operation an effort to keep the radiation on the antenna to a very low level that prevented enemy DF of the receiver location was necessary. Additionally, the low-level of radiation allowed the receiver to operate in the presence of other receiving and transmitting equipment and radar without interference. In order to allow demodulation of CW signals a "tracking" beat frequency oscillator (BFO) like that used in the RAG was incorporated into the design. Since the new receiver was not a superheterodyne, the BFO had to track the tuned frequency, providing a 1kc heterodyne which allowed CW to be readily copied. There were a couple of reasons for not designing the new LF receiver as a superheterodyne. First was to allow complete coverage of the tuning range of 15kc to 600kc. The 1931 solution to this problem had been the expensive RAA receiver that used four different IFs and BFOs to allow complete LF coverage. The second was that the conversion process in a superheterodyne can create a lot of internal noise in the receiver - a problem when operating in an already noisy slice of the spectrum. Federal Telephone & Radio Corporation had years of experience in building shipboard equipment for Mackay Radio and they were selected as the contractor to build the RBA receivers for RCA. Federal T & R Corp. was owned by ITT and had grown out of the old Federal Telegraph Company that was originally located in Palo Alto, California. FTC's chief engineer was Frederick Kolster, sometimes credited inventor of the directional loop antenna. Lee DeForest was associated with the company at one time. During the mid-twenties, FTC built consumer radios under the "Kolster" brand name. Mackay Radio & Telegraph Company had close ties to FTC and all early Mackay maritime radio equipment was built by FTC. When Mackay was purchased by ITT in 1928, it was not very long before FTC also was added to the growing list of companies owned or controlled by ITT. The purchase took place around 1931 and at this time FTC moved to New Jersey. In New Jersey, FTC continued to build maritime radio equipment, usually for Mackay Radio. Around 1940, Federal Telegraph Company's name was changed to Federal Telephone & Radio Corporation. At $3000 each, the new RBA receiver was certainly expensive and a look inside the receiver reveals an incredible level of electro-mechanical design and construction. The tuning ranges from 15kc up to 600kc in four bands. The illuminated dial readout is direct in kilocycles along with a two-dial logging scale. The mechanics of the design allow for super-smooth operation of the tuning system. The Gain adjustment controls the sensitivity of the receiver and a gear-driven auxiliary gain control operates from the tuning dial and provides constant gain levels across the tuning range. Two meters are provided, one to monitor Output Level in db and one to monitor the B+ voltage. An Output Limiter is provided for noisy conditions or unexpected strong local signals with the Output Level adjustment setting the output limiter's maximum level. Two levels of selectivity are provided, Broad selectivity is limited to about a 1300kc audio roll-off via an internal LP filter and the Sharp position is provided by a 1kc bandpass filter for CW in noisy conditions or in cases of interference. Audio output is 600 ohms Z and is intended for earphones although the RBA will drive a matched loud speaker if necessary. photo above: RBA-1, CFT-46154, Modified by Field Changes installed that removed the toggle switches for CW OSC and Output Limiter (changed to Freq Ext control) and replaced them with two position rotary switches. Front panel repaint but cabinet is still black wrinkle on this receiver. The separate power supply, CRV-20130, provides the filament voltage and B+ requirements via an armored cable with heavy-duty connectors. The power supply will easily operate two receivers for emergency conditions and two separate connectors are provided. This is the same power supply used for the RBB and RBC receivers (although the 17vac required for the RBB and RBC is not used by the RBA receiver.) The power supply has a cold-cathode regulator tube (OC3) and a HV rectifier (5U4.) The RBA uses eight tubes, three 6SK7 RF amplifiers, one 6J5 Triode Detector, one 6SK7 BFO, two 6SJ7 AF amplifiers and one 6K6 AF Output. The table top versions of the RBA receiver are identified as C(FT)-46154 or 46154-A (FT identifies Federal Tele.&Radio Corp. as the contractor) but rack mount versions use CFT-46300 as the receiver identification. Shown in the header photo is the CFT-46154 RBA-1 from 1943. All versions of the RBA's receiver circuitry are identical. RBA-1 to RBA-5 were black wrinkle finish but the RBA-6 was smooth gray paint as supplied to the USN. Many early RBA receivers were later repainted by the USN so it isn't uncommon to find early versions that were originally black wrinkle finish but are now smooth gray paint. photo above: This photo shows the McMurdo Station in Antarctica in 1956. The RBA, RBB and RBC were still in active use by the USN at this time over ten years after WWII ended. >>> Three IF amplifier stages were used along with a three step selectivity control, a noise limiter control and a switchable audio bandpass filter. Since the AVC could not be on when receiving CW signals, an Output Limiter circuit could be switched in (CW-OL) to keep static bursts or unexpected strong signals from overloading the receiver or the operator's ears. An adjustable squelch control called a "Silencer" was also included. The construction of the receivers were as much as possible alike allowing many of the same parts to be used for each model. There are some tube and component differences in the preselector section of the RBB/RBC but the IF/AF section is identical for either receiver. Three panel meters provided monitoring of Signal Level in db, Audio Output in db and B+ in volts dc. The audio output was designed for 600 ohm Z earphones and up to 20 pairs could be connected in parallel, (who knows why but that's what the manual indicates - 30Z ohm load.) Some of the later RBB/RBC receivers will have an additional 6AB7 tube installed along with a SO239 connector on the back of the receiver. This was an amplified IF output source generally used for a panadaptor. An internally mounted switch allowed the operator to select this IF amplifier output function if desired. The entire cabinet was mounted to the operating table by four shock mounts. >>> The 1940 selling price (to the government) for these incredible receivers was $2400 each - a staggering amount of money. An internal examination shows why the price was so high. These rugged, over-built receivers had to withstand the constant mechanical vibration while at sea in addition to the mechanical shock of firing multiple 16" guns (along with firing all of the other artillery present on battleships.) Also to be rugged enough to hopefully be able to withstand the shock of a possible torpedo or bomb hit and still keep communications operating. Since the ship had to supply its own power, the receiver circuitry and power supply stability had to withstand the severe power fluctuations that happened when gun turrets were rotated. Additionally, everything had to have maximum shielding to prevent stray emissions from the LO getting to the antenna and also to allow the RBB/RBC to operate in the presence of other receivers, transmitters and radar without interference. In many instances, the RBA/RBB/RBC receivers were so well-respected and their performance so good, they not replaced with more modern receivers until the mid-1960s - a testament to their magnificent design and construction. Shown in the photo above is the RBB-2 on the left and the RBC-3 on the right - both built by RCA. The McMurdo Station Radio Room photo shows three receiving stations. The nearest (#3) is using rack mount type RBB and RBC. The next station back is set up with three RBB/RBC receivers and one RBA receiver. The furthest station back is using two RBB/RBC receivers and one RBA receiver. Using either the RBB or RBC as the receiver in a vintage military amateur radio station requires some thought since neither receiver has any standby function, either on the front panel or remotely. Most USN operations had the receivers and transmitters on separate antennas and operating on "split frequency," that is, one receive frequency and a different transmit frequency. Most ship daily operations were in the receive mode only anyway. To use the RBB or RBC as a station receiver will require good isolation between the transmitter and receiver if they are using the same antenna. A dow-key relay will switch the antenna and some dow-key relays have an extra switch inside the coax barrel that further isolates the receiver. Other military type transmitters will have their own internal send-receive relay. Usually, isolation is good on these types of TR relays and some will ground the receiver contacts when in transmit. Check your transmitter's TR relay, if you're going to use it, to make sure that it does ground the receiver antenna input when in transmit. If you're going to use an external TR relay then utilize the auxiliary contracts to achieve a "receiver antenna input ground on transmit." There is a neon bulb and some other protection circuitry but grounding the antenna input is good added protection. As to muting the receiver, in CW there's no need and the receiver can act as a CW monitor. In AM, the gain control will have to be reduced to mute the receiver if you're using a loudspeaker. When using a headset, you'll probably hear yourself but you probably won't experience feedback. There are other methods to achieve "mute on transmit" but that would require internal additions to the the receiver and then a control line would have to be brought out the back of the receiver. Not necessary and it only compromises the receiver originality. The RBD receiver was used with the TCX transmitter as low-power, two-way communication equipment. The TCX provided CW at 32 watts output power and Voice at 9 watts output power. Antenna was a 24 ft. whip. The RBD receiver was a seven-tube superheterodyne that provided continuous tunable frequency coverage of 1.5mc up to 12 mc in four tuning ranges with an additional four crystal-controlled, fixed-frequency receiving channels that could be selected with a front panel rotary switch. Crystals were inside metal cases that resemble metal octal tubes and plug into octal tube sockets on the receiver chassis. A headset output was provided as well as a separate loud speaker output - both with individual output level controls. The circuit uses single preselection (one RF amplifier stage) along with a converter stage (mixer combined with LO in one tube) and a separate oscillator for the crystal controlled channels. Three IF amplifiers operate at 915kc. A combination BFO and Detector/AVC tube is used in the circuit. A single 6V6 provides the audio output. The bottom cover had shock mounts installed. Power requirement is +12vdc for the tube heaters and +220vdc for the B+. A dynamotor set-up could be provided for either +12vdc or +24vdc input. There was also a power supply available for either +110vdc or 110vac operation. The RBD (and the TCX) were not produced in large quantity and the serial numbers only go up to 500. The contract dates from 30 June 1941 however the "acceptance" tag is dated in 1944. The RBD shown in the photo is original finish with black wrinkle finish front panel and top, olive-drab sides/back and bare aluminum bottom cover. When operating the RBD today it's possible that a strong AM broadcast station operating on 910kc or 920kc might "leak" into the IF which is tuned for 915kc. Since the RBD has only one RF amp there isn't too much isolation although the receiver does have built-in adjustable wave traps for 915kc on the Antenna and 1RF tuned sections. If AM BC stations are being received via the IF be sure to check the adjustment of these wave traps. The RBD is a good performer although there isn't a lot of selectivity. Sensitivity with a short antenna is pretty good. Using a tuned ham type antenna, e.g., a tuned or resonant dipole, will provide extra isolation and should eliminate any AM BC leaking into the IF problems. However, using an untuned large antenna (like an end-fed wire without a tuner) will only allow strong AM BC leakage into the IF to happen much more readily. The receiver was designed for a 24 ft whip and it works best with a fairly short antenna or a tuned/resonant antenna. Audio output impedance is 600 Z ohms. 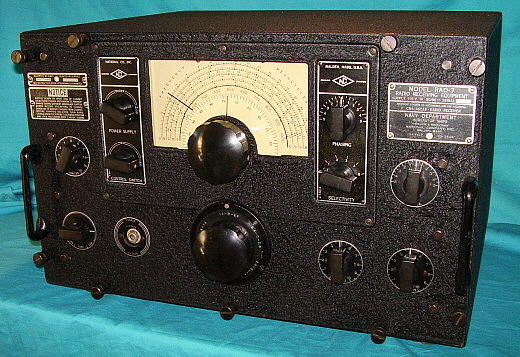 National began supplying the U.S. Navy with their NC-100A direct dial readout, coil catacomb band switching receiver by 1940. Designated as RAO, the first versions are somewhat similar to the standard NC-100XA receivers, which was introduced in June 1938. The early RAO circuit probably uses 10 tubes and tunes AM BC up to 30MC and also features a crystal filter, a S-meter, a tone control and a noise limiter. A 500 Z ohm audio output transformer was incorporated into the circuit as well, though this was standard procedure for Navy receivers and it is likely that the very early, first versions of the RAO also had 500 Z ohm outputs. This was to assure that the B+ did not appear on the speaker terminals as was standard for the civilian National NC-100 series. In fact, standard for the civilian NC-100A receiver was the use of a field coil type speaker and push-pull audio output, neither of which the Navy would have on their receivers. Consequently, the RAO and the RAO-1 should have modified audio output along with an extra filter choke to take the place of the "field coil used as a choke." 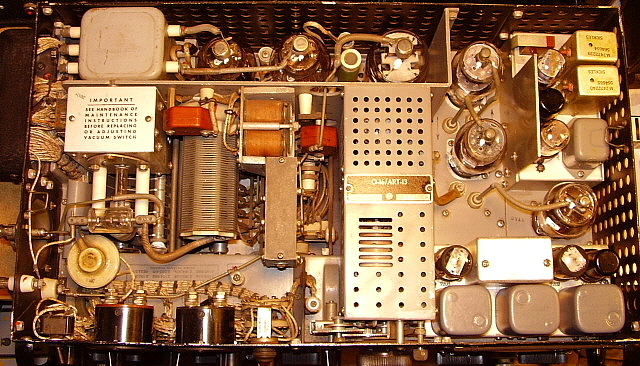 The civilian NC-100XA had push-pull audio employing eleven tubes. Since the push-pull audio was eliminated on the early RAO, it probably employed ten tubes. Before WWII began, the Navy wanted minimal radiation from the receiver's Local Oscillator on the antenna. This was primarily to allow the receiver to be used in the presence of other shipboard radio equipment without interference, although that probably didn't sound as important as the most publicized reason, that of stopping enemy direction finding and locating efforts. Beginning with the second of the numbered suffixes, the RAO-2, National added an extra RF Amplifer with an additional coil catacomb and tuning condenser housed in a bolt-on rear chassis and cover. The extra RF Amp provided the isolation necessary to keep the LO radiation on the antenna below the designated level of <400pW. The engineering and design upgrade to add double-preselection (two TRF amplifiers) to the RAO probably dates from mid-1941. The USCG R-116 receiver contract dates from May 15, 1941 and it incorporates double-preselection in the same manner that the RAO-2 does. The second TRF amplifer was set-up for unity gain, so, ideally, the RAO-2 would have similar sensitivity to the single-preselection versions. The RAO-2 was also set-up to use the improved Crystal Filter that had been introduced with National's NC-200 receiver (in late 1940.) This Crystal Filter used a stepped-switch for Selectivity and a variable condenser for Phasing. With the new Crystal Filter, the IF was changed to 455kc, the industry standard and the IF of the NC-200 receiver. The additional RF amplifier increased the RAO-2 tube-count to eleven. Most WWII equipment was built under contract and not all RAOs were built by National. Wells-Gardner Company was the second contractor for the RAO series, building the RAO-3, 4 & 5. The Wells-Gardner versions were generally intended for shore stations and, for some reason, the Navy didn't consider them to be "heavy-duty military-type" construction although the receivers are nearly identical to the National versions. RAO-2 and RAO-6 receivers will have an ID from National of NC-120 located on the crystal filter control nomenclature plate. Shown in the photo to the left is a Wells-Gardner RAO-3 (115vac only) from 1943. I found this particular RAO-3 receiver in 1969. It was a derelict that had been abandoned in a greasy driveway. Most of the tubes were missing and the interior of the cabinet filled with small rocks. I took it home for repair and then used it initially as my first real "ham" receiver making several CW contacts on the 15 meter Novice band. After 37 years of minimal use (mostly storage,) the old RAO-3 has recently undergone another restoration to bring it back to full operation and first-rate appearance (2006.) This is the same RAO-3 that was featured in an "Antique Radio Classified" magazine article in the late 1980s titled "Rios Radio Revisited" and it is also pictured in Raymond Moore's book, "Communications Receivers - 4th Ed." under National RAO. National continued on with the Navy contracts building the RAO-6, 7 & 9 (the designation RAO-8 was not used.) Early RAO-6 receivers had S-meters and are very similar to the RAO-2. Later RAO-6 versions were equipped for panoramic adapter use and eliminated the S-meters. The RAO-7/9 receivers were of robust construction and had increased shielding to further allow their use with other shipboard equipment without interference. The audio output Z was changed to 600 ohms with the later versions. The RAO-7/9 eliminated the S-meter in favor of panoramic adapter connections as the late versions of the RAO-6 did. The RAO 7/9 simplified the maintenance of the receiver by designing the chassis so that it was easily removable from the cabinet (handles were added to the receiver front panel to assist removal.) The cabinet itself was redesigned for better shielding and easier mechanical construction by making it a one piece unit. The early RAOs had used a separate shock mount system but the new cabinets mounted the shocks directly to the bottom of the cabinet further easing construction and maintenance. The RAO-7 & 9 receivers are physically larger than the earlier versions with full 19" rack width panels although the receivers are not designed for rack mounting. The earlier RAO versions are 17.5" wide, with an integral panel-cabinet-chassis construction that requires major disassembly to service or repair. The RAO receivers have impressive sensitivity even though the second RF amplifier is running at unity-gain. The stability is also impressive with very little drift after a short warm-up. The tuning rate is quite fast which was probably intentional for quick band scanning for signals. The fact that the later RAOs have provisions for panadaptor operation seems to confirm that they were used for surveillance rather than communications. 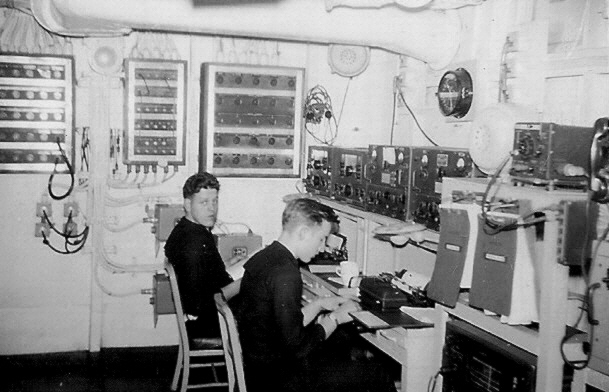 However, much of shipboard radio operations were in the receive-mode. The receiver shown in the photo to the right is RAO-7 SN:J444. This receiver was destined for the South Pacific and, as a consequence, it was given a moisture and fungus preventative coating (MFP.) The MFP was applied to the chassis, front panel tags and knobs giving the receiver tags a gold appearance. The receiver shown in the top photo is the National RAO-7 SN: 10. The contract date is Sept. 22, 1943 and the Navy acceptance date is in 9-30-1944. National-chassis stamped serial number is H720. This receiver was stored for many years at the Alameda Naval Air Station in California though it was never installed or put into service. It was never MFP'd. It is in excellent condition and is an all original example that functions beautifully. Restoration details are on the "National NC-100 Series Moving Coil Receivers" web-article. Navigation link in Index at the bottom of this page. 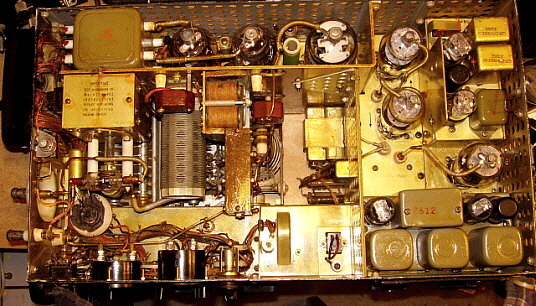 The RBH was the Navy designation for the NC-156 receiver, a 10 tube superhet that covered 300kc to 1200kc and 1700kc to 17mc in five bands utilizing National's famous moving coil-catacomb bandswitching system. The receiver is a version of the NC-100XA that allowed continuous coverage of the 300kc to 500kc range by having the IF operate at 1500kc (which is why there is a gap in the tuning from 1200kc to 1700kc.) The receiver also features single preselection, two IF amplifiers, crystal filter, S-meter, BFO and tone control. The dial uses the articulated pointer that indicates band in use by its alignment with the proper tuning scale on the illuminated dial. The initial RBH receivers will have "NC-156" on the National Co. nameplate (part of the crystal filter panel.) 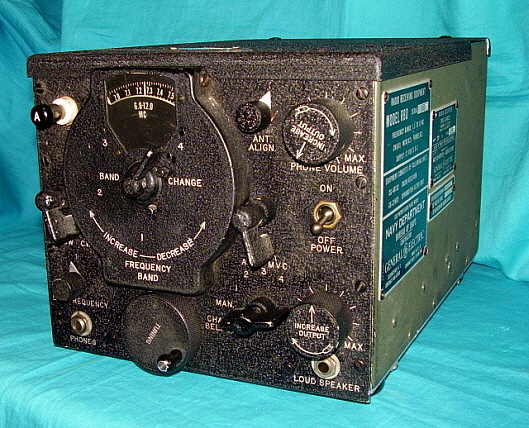 The first RBH receivers date from around 1940, however the receiver required some modifications for use at sea during WWII and a series of RBH receivers followed. All of the RBH series with number suffixes, e.g. RBH-1, RBH-2, etc., have an additional stage of preselection added with a bolt-in chassis and cabinet to house the additional catacomb section for the coils and an additional tuning condenser for tuning the stage. This addition was very similar to the RAO receiver change and was for the same purpose of reducing the LO radiation from the antenna (>400pW on the antenna.) The dial system changed on the later RBH receivers, eliminating the articulated pointer and painting the background white rather than silver. 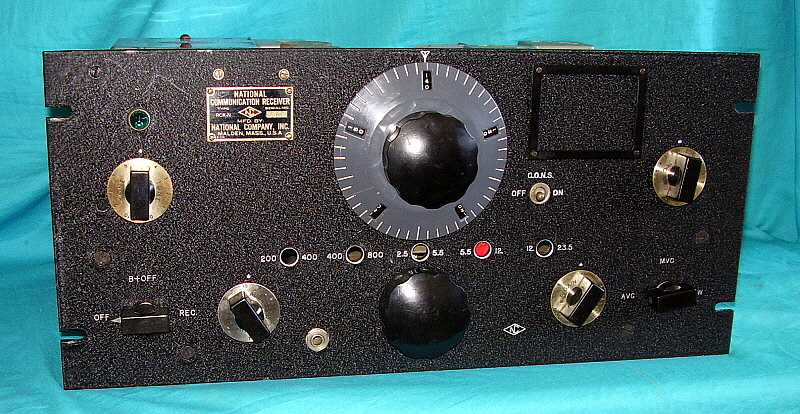 The last of the RBH receivers incorporated the same improved cabinet of the later RAO receivers. When operating an RBH today, strong AM-BC stations around 1500kc will resonate with the RBH's 1500kc IF amplifiers and can cause strong heterodynes when tuning in stations or, if the 1500kc AM-BC station is particularly strong, it may dominate the IF system of the RBH. A 1500kc wavetrap on the antenna lead-in will usually cure any serious problem. The early RBH receiver shown in the photo above unfortunately has had all of its Navy tags removed. Although the "urban legend" is that surplus dealer sales required tag removal but this is unlikely. Another story is that if tags were still on a surplus unit the government could "reclaim" it because they would consider it stolen equipment so the new owners removed the tags. Again, hard to believe. The most likely reason for missing tags is that post-war owners of WWII surplus gear removed the tags so the equipment would appear to be new "civilian" models that would impress their friends. National had been building receivers for airport communications since 1932 with their contract for RHM superheterodynes. 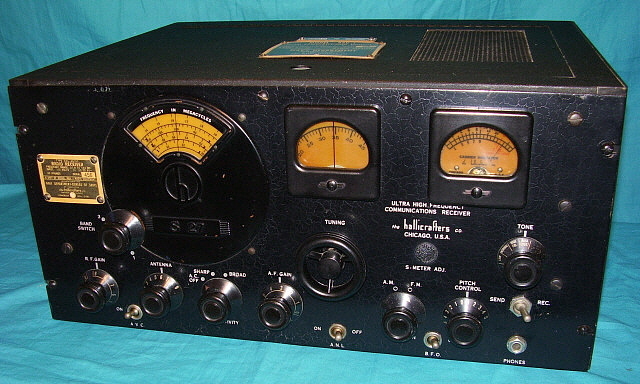 The HRO was destined for airport use but its many accessories, such as multiple coil sets, power supply and speaker seemed to limit its popularity as an "airport receiver." In 1936, National introduced the NC-100 "Moving Coil" Receiver. Only a speaker was required and the receiver was easy to use and very durable. 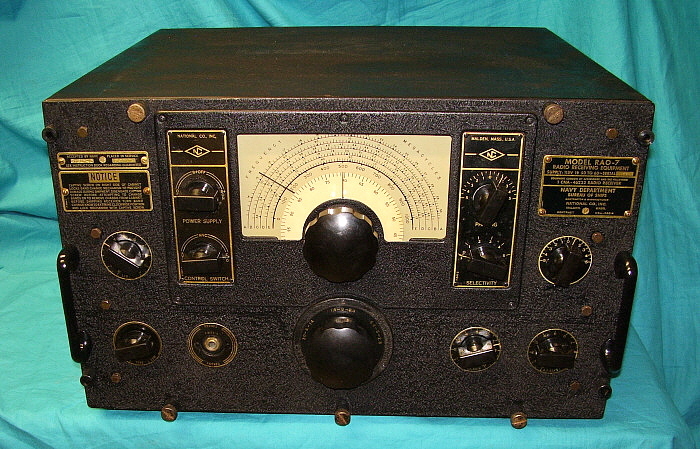 By 1937, National had introduced the RCD, an NC-100 especially made for airport communications use. That was followed by the RCE that had further refinements to airport use. The RCF and the RCF-2 came along in 1940. During WWII, USN airport ground-to-air communications required some changes to the standard National Airway Communication Receiver. The USN needed more than just the 200kc to 400kc band that had been standard for Airway receivers. National added 400kc to 800kc to allow the USN full use of that part of the spectrum since the Navy was particularly in need of complete coverage of the entire 400kc to 500kc band. The remaining HF bands cover 2.5mc up to 23.5mc, again, slightly different than the standard Airway receiver but tailored to what the Navy needed. 12 tubes are used in the RCK-N with no S-meter or carrier level indicator supplied. The C.O.N.S. switch is a "Carrier Operated Noise Silencer" that acted as a squelch control allowing the receiver to operate only when a carrier was present. Since the receiver covers 200kc to 800kc continuous, the IF had to be moved from the standard 457kc (for Airways receivers only) up to 1560kc. Audio output uses a single 6V6 into a 600Z ohm load. The entire Airway communication receiver line continued with the RCL that featured a two-position bandwidth switch. After WWII, RCK and RCL receivers were rebuilt into the RCP and RCQ receivers by specialized contractors (not National.) 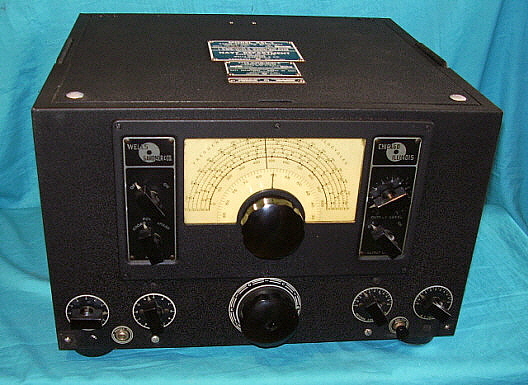 The last National Airway receiver was the RCR from 1948 and it was based on the NC-240CS receiver. The model letters RCK were concurrently assigned to both the National Airway receiver and to a Navy VHF four channel receiver. Rather than reassign different letters, National's Airway receiver used a suffix "-N" to differentiate it from the other RCK receiver. As mentioned above, Wells-Gardner Company was also a contractor for the RBL receiver building the RBL-3 (and probably the RBL-4.) The W-G RBL-3 is almost identical to those versions built by National with the exception that W-G used their own transformers and chokes along with their own sources for smaller components. Most of the major parts are built by National so the similarity between the W-G versions and the National versions is very apparent. Performance is likewise similar to the National RBL receivers. The Navy found little use for S-meters or Crystal Filters so the HRO Junior receiver, which lacked these features along with amateur bandspread coil sets, was a good receiver to start with to create what the Navy needed for various communications and monitoring functions. First, the Navy wanted an HRO that would tune continuously from 50kc up to 30mc. The Navy was especially interested in uninterrupted tuning in the 400kc range. This required National to re-engineer the HRO IF section to tune at 175kc and also to modify the LO coils in the coil sets that were supplied with this variant of the HRO Junior designated the RAS. Seven coil sets were supplied with the RAS that allowed coverage from 190kc up to 30mc with complete coverage of the 400kc part of the spectrum. The RAS was installed into a 36" tall table rack that also included a coil storage unit and power supply. Sometimes a loud speaker panels is also installed in the rack. Most Navy HRO racks didn't have loud speakers because nearly all reception was done using head sets. If you run across any "orphan" coil sets that have the coil assembly insulator marked with the number range of 5,6,7 or 8, these are 175kc IF coils and they are for the RAS. The RBJ is a similar HRO Junior variant that covers 50kc to 30mc with nine coil sets. Frequency coverage is actually 50kc to 400kc and 480kc to 30mc. The 80kc gap in the frequency coverage is around the IF of 456kc. The RBJ is also installed in a table rack. Shown in the photo to the left is the RBJ-2 receiver from a photo in the manual. 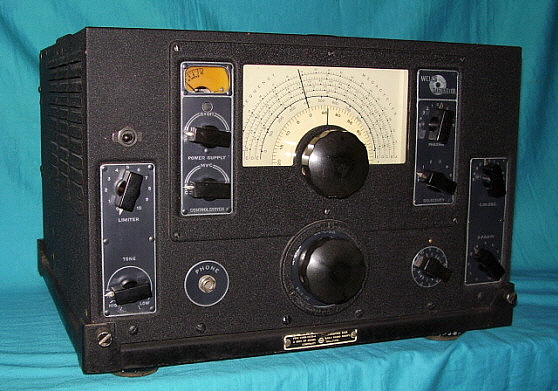 Sometimes the RCH is categorized as a "morale/entertainment" radio for the Navy, however the military manual makes no mention that the RCH was intended for entertainment and, of course, the receiver is quite different from the Scott SLR receivers (including the RBO receiver) that were specifically for shipboard entertainment use. The RCH tunes from 80kc to 560kc and from 1.9mc to 24.0mc in five tuning ranges. LF coverage implies that the RCH was for Navy communications. The two tuning ranges (LF and SW) are continuous coverage within their coverage (the SLR provides AM BC and two bandspreaded SW ranges.) Also, the receiver has a BFO (so do some models of SLR receivers) and has the typical mode-selecting determining whether the GAIN control functions as an RF gain (in the CW mode) or as a AF gain control (in the MOD mode.) The RCH also provides an output limiter (CW OL) that removes the AVC and limits the available gain via a pot adjustment on the side of the receiver chassis. All of these functions imply that the RCH is a communications receiver. Additionally, two RCH receivers can be set-up to allow simultaneous reception of two different frequencies by one operator (PHONE CONTROL.) This was usually done while "guarding" frequencies, essentially monitoring two different frequencies for intermittent signals of either enemy or friendly origin. All things that an entertainment receiver would not be expected to do. The RCH circuit uses single preselection (one TRF stage) with two stages of IF amplification and has a total of eleven tubes. The IF is 585kc, certainly not a standard frequency but it was employed to allow continuous coverage of the region of the spectrum between 300kc up to 500kc where the USN did a signification amount of communications (the standard 455kc IF would not allow operation for about 25kc either side of the IF thus not allowing coverage of 430kc up to 480kc.) The selectivity is fixed and determined by the IF bandwidth which is about 8kc at 10 db down. The audio output impedance is either 20K or 600 ohms. One has to install a jumper on terminal boards located on the side of the receiver to select either the 20K or the 600 ohms depending on the listening set-up. Hi-Z phones would use the 20K line but if a loud speaker or lo-Z phones were used then the 600 ohm line would be selected. If the 20K line is selected then a 600 ohm load resistor needs to be installed across the 600 Z ohm terminals. About 2 watts of audio is available to the loud speaker if used (single 6V6 audio output.) The audio circuit doesn't have any specific filtering to limit bass response but overall fidelity is about 70hz to 3500hz at 3db down. One can also adjust a pot on the side of the receiver to limit the amount of audio available at the phone jack. The Antenna Trimmer only functions on the two lowest frequency bands (80kc to 560kc.) There may have been a specific loudspeaker produced for the RCH but it isn't mentioned in the USN manual. Performance is quite good on the lower frequencies but since there is only a single TRF stage images do begin to show up around 10mc. The larger and more elaborate the antenna system used, the more of a problem the images will be. If reception above 10mc is necessary, an antenna specifically tuned for (or cut for) the desired frequency of reception will help in reducing images. Sensitivity specifications indicate that Band 3 has the best response at about 6.5uV at 20db S:N. The other bands are spec'd at around 10uV, so don't expect to hear the stations that are at the "noise floor." On LF, I was able to copy FCH 344kc, CC 335kc and MOG 405kc during the day which indicates that the RCH performs like most LW receivers of the period when it comes to copying NDBs. On the higher frequencies, SW BC and AM hams sound very nice. On CW or SSB, the BFO has too much frequency variability, that is, just a slight adjustment of the control will result in several hundred hz change. This makes using the BFO for "fine tuning" SSB difficult. Dial accuracy is superb given that any dial of the period is going to have limited resolution but "markers" like WWV are "right on" (provided the receiver has been aligned recently.) No remote standby is provided so using the RCH as a station receiver will require some thought. Separate receive antenna would be the easiest solution but this will require turning down the gain during transmit. Same with an antenna relay, although there is a disconnect of the antenna, turning down the gain will be required. On board ship, most operation was "receive-only" and any transmissions were usually not on the same frequency as reception, so receiver standby was not needed. The RCH is a Scott SLR-type receiver in that it is a low-radiating receiver that produces less the 400 pico watts of LO leakage to the antenna. This was a Navy specification for all shipboard receivers that was to prevent the reception of the LO radiation (or leakage to the antenna) by enemy DF equipment or enemy receivers. Additionally, SLR receivers would not interfere with other radio gear and would not be interfered with by other radio gear on the ship. The large cabinet and shock-mount base is standard for the Scott receivers and accounts for about 35 lbs of the total weight of 106 lbs for the RCH. The early RCH dial escutcheon had a white-filled "S" as shown in the photo above. The "S" was eliminated on later versions of the receiver. 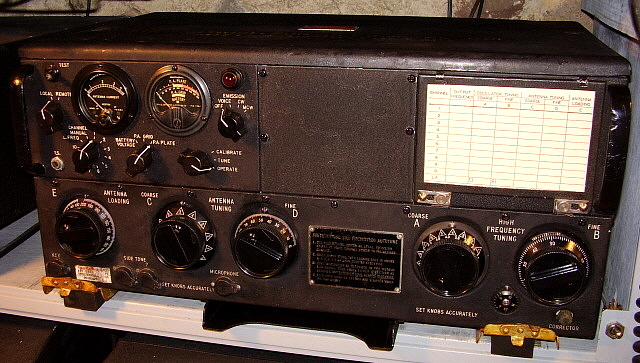 The RBK Series of VHF receivers were produced for the USN by Hallicrafters and were essentially their S-27 model. The RBK tunes from 27mc up to 145mc in three tuning ranges and will receive signals in AM, CW or FM. The IF is 5.25mc and two selectivity positions are provided. Audio output is a pair of 6V6 tubes in P-P with 500 ohm Z and 5000 ohm Z outputs. 15 tubes are used and features three acorn-type tubes in the front end, 956 RF amp, 954 mixer and 955 LO. As the RBK series evolved, it followed the S-27 upgrades and eventually became the S-36 and S-36A versions of the receiver. Many RBK receivers will be the S-36 version of the receiver but the tuning dial bezel will still have "S-27" embossed on it. It's generally believed that Hallicrafters used up all of their S-27 bezel stock before switching to the S-36 bezels. The later versions of the RBK will have a different S-meter that has a white scale and is non-illuminated. Also, some very late RBK receivers will have an extra RF amplifier for increased isolation between the receiver and the antenna. Most RBK receivers were used with panadaptors for surveillance and enemy signal monitoring, both on shore and at sea. The R-303/FRR tunes from 2mc to 20mc in four tuning ranges. The circuit is a single preselection superheterodyne utilizing 14 tubes, 11 of which are in the receiver and the remaining three are in the combination power supply and push-pull audio amplifier. Two stages of IF amplification are provided. An Output Limiter, Antenna Compensation and Broad or Sharp Selectivity are also provided. The receiver uses a 6V6 3rd audio output tube that drives the Phones output but the audio signal is also routed to the PP-445/FRR where two 6V6 tubes are used as push-pull audio output tubes provided about 8 watts of power. The tube line up in the R-303/FRR are six volt heaters but the RBS-1 and RBS-2 receivers used 12 volt tubes. However, the RBS-1 and RBS-2 power supply-amplifier used two 6V6 tubes for the push-pull output and these two tubes had their heaters wired in series to allow running on 12 volts. The early power supply-amplifier was CCT-20235-A and it can only be used with the RBS-1 or RBS-2, not with the RBS-3. Conversely, PP-445/FRR can only be used with the RBS-3 and not used with the RBS-1 or RBS-2. Of course, this assumes that no modifications have been installed into the units. Physically the RBS-1 and RBS-2 are painted black wrinkle finish. The knobs on the RBS-1 and RBS-2 have large letters engraved and white filled to easily identify their function. The RBS-3 is painted gray and uses standard RCA-style knobs. Various contractors built all versions of the receiver. 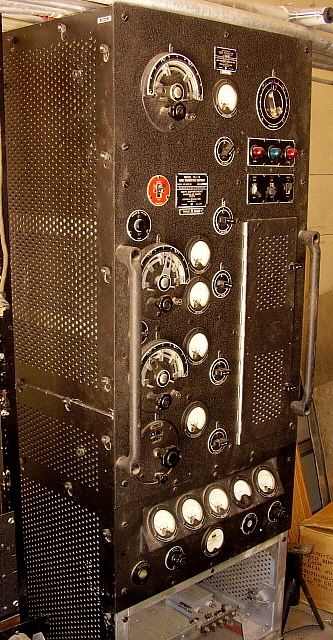 The TAJ-19 was a 500 watt CW and 250 watt MCW transmitter that operated from 175kc up to 600kc. The transmitter used only four tubes. The MO was a 860, the IPA was also a 860, the AF Osc was a 860 and the PA was a 861. The TAJ-19 was powered by a motor generator set up the provided 1500vdc, 3000vdc (PA plates,) 1200vdc and 115vdc (for control circuits.) AC voltage was applied to the tube filaments by way of slip rings that ran on the DC driver motor. The rack, chassis and panels are all aluminum. TAJ transmitters were found on most larger Navy ships during WWII. Though the Navy catalog states that they were for cruisers or destroyers, they were used on most large Navy ships for Medium Wave and Low Frequency transmission requirements. This TAJ-19 was left in my driveway back when I was still operating the Western Historic Radio Museum in Virginia City. I had a telephone call some months before from a ham in Washington state who was "cleaning house." He said the next time he was down in Nevada he'd drop off some equipment that had been used at Grand Cooley Dam for guided tours and public address. I never thought too much about it since it sounded like it was audio gear that was mainly for parts. I really stopped thinking about it after I didn't hear anything for a month or so. Months later, I was coming home from running some errands and there in my driveway was a seven foot tall rack full of audio equipment like rack tape players and speaker panels. Also, a pile of audio cables and miscellaneous other types of audio equipment. To the side of the audio gear was the TAJ-19. The fellow had mentioned an old Navy transmitter that might be good for parts but not what type it was. It was odd that the guy didn't "hang around" town since it was Virginia City and there were all types of distractions (maybe I mean attractions) to pass some time. Not to mention, I had only been gone for a little over an hour. Perhaps he was in a hurry and just "dumped" the gear and left. Anyway, I never heard from him again. Now, this TAJ-19 is not complete. It has been severely scavenged for parts over the years. I'd estimate that around half of the transmitter is missing. But, the cabinet and the panels are excellent and complete with knobs, meters, switches and even all of the data plates. Only the very bottom front panel is missing. The sides, back and top are all present. The various chassis are present. Even a couple of the 860s are still installed. So, while this particular TAJ-19 will never again be operational, if another TAJ-19 ever showed up around here, who knows? Maybe between two of them, one functional transmitter could result. Of course, Medium Wave and LF CW for the amateur is somewhat limited with only two bands approved at this time - 630M and 2200M. 630M or 472kc to 479kc allows CW and data operation with a 5 watt EIRP limitation. It's not as low of power as one would think. Due to the inefficiency of most ham antennae at low frequencies, the effective radiated power can be rather low even though the input power is relatively high. Think of a dummy load. You can input a lot of power and it radiates very little. Most antennae on 630M are something like the dummy load. The typical ham antenna on 630M would have about 400 watts input before the EIRP would be about 5 watts. So, there may be hope for an operational TAJ-19,...if one can figure out how to power it up without the shipboard power and the motor-generator set-up. A fairly large homebrew AC power supply is the most likely solution. 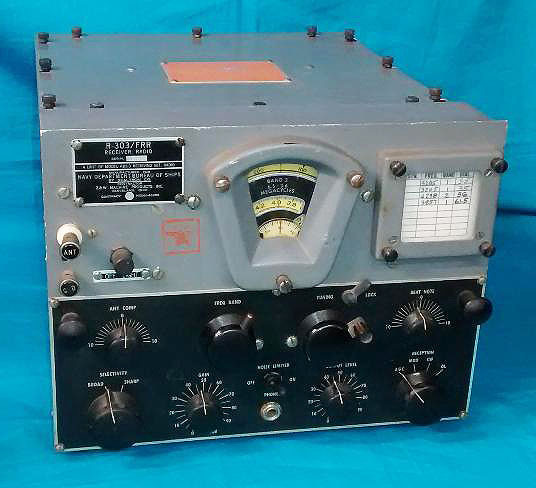 The Collins T-47/ART-13 is a 100 watt carrier output, AM-CW-MCW transmitter that was generally used in USN and USAAF/USAF aircraft but could also be found onboard USN ships as the TCZ installation. There were even some vehicular uses for the T-47/ART-13. The T-47/ART-13 was developed from the earlier Collins ATC Navy Aircraft Transmitter that appeared around 1940. By 1942, Collins was building the T-47/ART-13 for installation in Navy aircraft and other applications. The USAAF also wanted to use the T-47/ART-13 and a very slightly different transmitter was produced for their use, designated as the T-47A/ART-13. Many of the T-47A/ART-13 transmitters were built by contractor Stewart-Warner. Documentation was changed near the end of WWII to designate the transmitters as AN/ART-13 with the A suffix included. When combined with other equipment the set-up designation is for the entire installation. 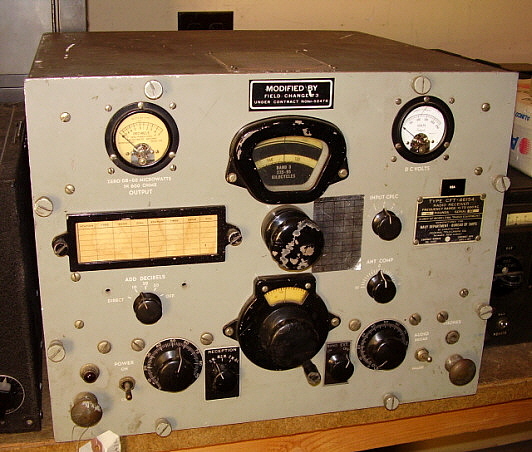 Hence, the combination ARC-8 describes the ART-13 combined with a BC-348 receiver along with the other necessary auxiliary equipment for a complete aircraft radio installation. The T-47/ART-13 power requirements were supplied by a dynamotor that ran on the aircraft +28vdc battery/charger system. The aircraft battery buss supplied the +28vdc@10Amps necessary for the transmitter's tube filaments and relay operation while the dynamotor provided a dual output of +400vdc and +750vdc. The dynamotor would have the two B+ levels connected in series for the HV Plate ( +1150vdc) below 20,000 to 25,000 feet altitude but a barometric pressure switch (located inside the dynamotor housing) would separate the outputs at higher altitudes and only allow +750vdc maximum to prevent arc-over. There were at least three types of dynamotors used, the DY-17, the DY-11 and the DY-12 (after WWII an improved DY-17A was produced.) The shipboard TCZ featured two types of power supplies, a 115vac operated power supply (of enormous proportions) that supplied the required +28vdc, +400vdc and +1150vdc directly to the transmitter Additionally, the 115vac unit had a motor-generator that provided +14vdc and +28vdc (the +14vdc was required for relay operation inside the ac or dc operated TCZ power supply.) The115vdc operated TCZ power supply used two dynamotors that ran on 115vdc input and provided +14vdc and +28vdc output on one dynamotor and +400vdc and +1150vdc on the second dynamotor. The USMC had a vehicular set-up that installed an ART-13 transmitter with a BC-348 receiver that operated from the back of a Jeep and ran on the +28vdc battery system with HV provided by a DY-12 dynamotor. The antenna used was a whip. The T-47/ART-13 featured an advanced Autotune system that would automatically tune up to 11 preset channels (10 channels plus one LF channel) selectable by a front panel switch. The Autotune system would tune the transmitter frequency and output network to mechanical presets that then would match a properly selected antenna. The Autotune cycle took about 25 seconds to complete. Switch position MANUAL would allow manual adjustment of the tuning without disturbing the Autotune presets. The T-47/ART-13 uses an 837 as the variable frequency oscillator, two 1625 tubes are used as multipliers, an 813 as the power amplifier and two 811 tubes as the P-P modulators. There are also two small modules. One provides the audio amplifier and sidetone amplifier using two 6V6 tubes and a 12SJ7 tube and the other module, the MCW/Frequency Calibration Indicator, uses two 12SL7 tubes and a 12SA7 tube. FCI allows the operator to calibrate the frequency of the transmitter by providing a 50kc calibration signal derived from a 200kc crystal oscillator. The transmitter frequency range is from 2.0mc to 18.0mc, however many Navy T-47/ART-13 transmitters were equipped with a plug-in Low Frequency Oscillator (LFO) module that allows the transmitter to operate from 200kc to 600kc or 200kc to 1500kc. Early LFOs have a frequency range of 200kc to 1500kc in six ranges while the later LFOs cover 200kc to 600kc in three ranges. The LFO module uses a single 1625 tube. There are some indications that the Navy preferred the 200kc to 1500kc LFO while the USAAF used the 200kc to 600kc LFO. Many versions of the T-47/ART-13 will have a blank plate installed where the LFO module was installed (along with a resistive load substitute for the LFO's 1625 filament.) After WWII, the USAAF/USAF didn't use the LFO module but the USN still did. This statement is according to the USAF Extension Course 3012 book on "Radio Mechanics" although this book is from the 1950s and may reflect the uses of the LFO at that time rather than during WWII. Many transmitter installations also used a separate antenna tuner for LF operation and three selectable condensers to allow easier loading into various antenna impedances at some frequencies. Also most installations on aircraft included a small Remote Control Panel that allowed the pilot to operate the transmitter from the cockpit. There are a couple of different remotes and three different antenna tuners that could be used with the ART-13. To the right is a photo showing the chassis of the Collins-built T-47/ART-13. This transmitter has the Navy version LFO installed. Also, this is a fairly early version of the transmitter so there are some differences when compared to the T-47A/ART-13 versions. Of note is the lack of an interlock switch which on the early versions allows you to easily operate the transmitter with the lid off. The module to the lower right is the Audio Amplifier unit and directly behind it is the 837 VFO tube. Behind the VFO tube is the FCI/MCW module and to the left of it are the two 1625 multiplier tubes. The module in the center of the transmitter is the LFO. In the section at the rear of the transmitter, to the left side is the modulation transformer from which its plate leads connect to the two 811 modulator tubes. To the right of the 811s is the 813 PA tube. The left-center section of the transmitter contains the matching network and the LF relay (next to the LFO module.) On the far left is the vacuum TR switch and behind it is the keying relay. The round ceramic unit in front of the vacuum TR switch is the inductive pickup for the Antenna Current meter. The somewhat later USAAF T-47A/ART-13 version added some minor improvements to the transmitter with a vernier scale on the VFO Fine Tuning, a top lid interlock switch, a different bottom plate with built-in guides for the shock mount and a white ceramic insulator bell on the antenna connection being among the most apparent changes. There was also a T-412/ART-13B that added a selectable crystal oscillator in place of the LF module. The crystal oscillator normally has 4 LF/MF channels and 20 HF channels. 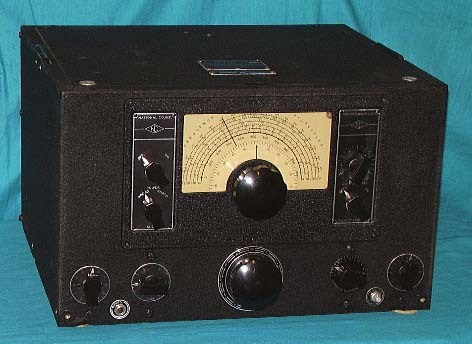 All ART-13Bs are retrofitted earlier models and it is possible to find even an early ATC transmitter that has been converted to the ART-13B version. photo above: Chassis of the Collins USN T-47/ART-13. The MCW/FCI module is the later, three tube version. The Collins chassis are usually painted gray and have a "winged emblem" embossed near the 837 VFO tube. photo above: USAAF T-47A/ART-13,aka AN/ART-13A. Note the blank panel installed to replace the LFO. Also note that the two meters do not match. This is very common to find on many ART-13 transmitters and was probably a result of depot repairwork. The T-47/ART-13 and its variations had a very long life. Introduced around 1943-44, actively used during and after WWII and well into the fifties (sometimes found still being used well into the sixties and early seventies.) The USSR also produced a copy of the ART-13 that they used up well into the 1980s (the R-807.) Because of its long useful life, most T-47/ART-13 transmitters found today will have had many scratches and a few dents and paint scrapes. Sometimes non-matching modules will be encountered with some parts having MFP applied and others that are bare. A book containing brief instructions and the calibration settings for specific frequencies is usually stored in the metal pocket underneath the transmitter. This book is also usually missing on most transmitters although the same information is in the standard manuals. Luckily, thousands and thousands of T-47/ART-13 were built and spare parts are very easy to find which allows for the fairly easy restoration and maintenance of these durable and potent transmitters. 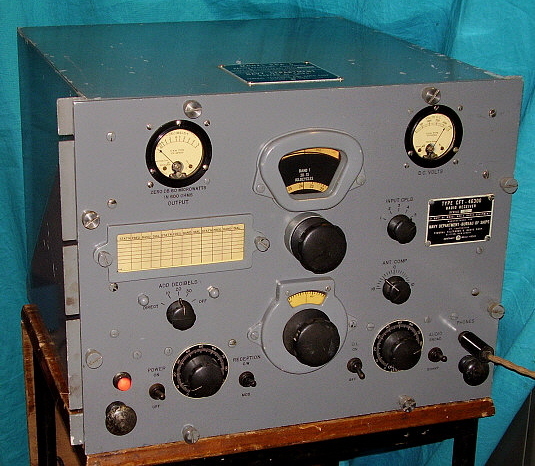 Nowadays, the T-47/ART-13 is finding increased popularity as a very practical ham transmitter for vintage military station operation. The transmitter can provide plenty of power and excellent audio allowing many military radio enthusiasts to use their T-47/ART-13 station for regular AM net operation also. The HV can be safely increased to around +1400vdc to provide even more output power and some brave users will run the HV up as high as +2000vdc (not for the timid and distortion might be encountered at this level of HV.) This assumes that the user is building an AC operated power supply rather than using the "hard to find" original dynamotor or the impossible to find TCZ power supply. The Audio Module has a "fixed-level" gain setting that was designed to work with specific WWII vintage military microphones. There are two microphone problems that are normally encountered - first, the military expected the radio operator to "scream" into the microphone. After all, he was trying to talk over the aircraft noise and was probably being shot at! After WWII, many ART-13 audio modules were modified by changing the carbon mike bias resistor from 15K down to 4.7K. In fact, the ART-13B schematic shows the resistor value as 4.7K. Modified audio modules have no problem providing plenty of carbon mike response. An easy way to achieve proper modulation levels is to use an Astatic TUG-8 stand with a D-104 or 10-D microphone "head" (with "DYNAMIC" selected on the Audio Module.) These mike stands have a built-in, adjustable gain amplifier that provides ample audio output to drive the fairly low input Z of the T-47/ART-13 (~ 500Z ohms.) An oscilloscope should be used to monitor the transmitter output when trying out different mikes as it will be very apparent on the 'scope whether proper modulation is being achieved. Due to the unbalanced, low reactance typical ham antennas used on 80 and 40 meters, the T-47/ART-13 will require an auxiliary capacitor connected to the COND terminal to ground for proper loading of these kinds of antennae. These external capacitors should be high voltage rated ceramic types. A large air-variable can also be used. Usually 200pf to 500pf will work. photo above: Chassis of the AN/ART-13A. Note the "gold" appearance from the MFP coating.